1. Many companies are planning to meet their cost savings plans with solid projects, however they are just meeting the targets. There is no room in their plans for risk issues, such as delays in new projects or products, changes of direction, or some other curve ball that could be thrown. The element of “risk” in meeting the objectives is not understood. 2. New products provide an avenue for increased revenue, however Procurement must tie into the plans with supplier strategies that are agile enough to increase or decrease volumes based upon market requirements. In addition, supplier relationship management (SRM) becomes paramount; resources must be ready and aligned to facilitate the right relationship. 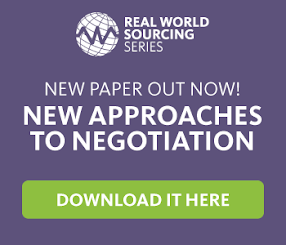 Contracts that structure demand consumption, working capital between buyer and supplier, and variability factor can improve relationships if each party collaborates to deliver more value. 3. In a recent conversation, I heard a sourcing change agent note “their team is calculating the lost EPS and time to value with each day of delay in completing a sourcing event (RFX, Contract, Compliance to new value source).” This client also told me their new calculation for non-compliance is measured in terms of EPS loss. Earnings per share (EPS) is a great measurement of value contribution. While most companies can speak about it at the C-level and into the investment community, can Procurement show the relationship between their performance and EPS? Most organizations can’t get beyond measuring cost savings against some sort of standard, let alone tying it to the product and earnings. The Finance team is critical and can pave the way, along with visibility and alignment across stakeholders. 4. Change management, leadership and stakeholder engagement is often taken for granted. Unfortunately this is where most companies fail in their delivery of contribution value. The three must come together so the business is on the same page and together making the changes that deliver more contribution value.